Note: This standard has been prepared by Mr. Nicholay Atanassov, based on his own research on the Bulgarian Shepherd Dog breed. Until now (March 2006) this breed was not officially recognized by any of the international organizations, so it is impossible to speak about any kind of official internationally valid standard. Exterior measurements of more than 200 dogs were used to prepare this standard. All received data are mathematically processed. 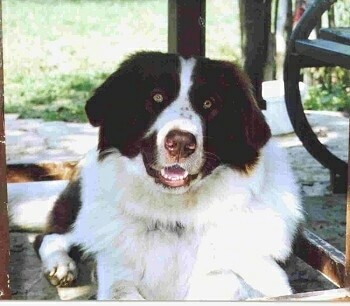 Head: The head of the Bulgarian Shepherd Dog is typically molossoidal. There is neither the rough oval of the mastiff-type dogs, nor the strongly manifested cheek-bone arcs. Massive, broad and rounded with slightly oval form on the pate. Cerebral part of the skull, seen from above, is similar to a square with slight narrowing at the muzzle.Slightly prevails at length the facial part. The muzzle is massive, broad, medium at length, slightly obtuse. The nose is black, well-shaped with broad nostrils. The teeth are strong and white to ivory in color. The bite is a scissors type. The eyes are deep-set, not protruding, dark in color and expressive. When white pigment of the skull part of the head is prevailing, it is possible to be slightly pale. The ears are normally placed, often even high placed. Also, individuals with low placed years can be observed which is not typical for the breed. As a whole, the Bulgarian Shepherd Dog is compact and symmetrical, with a slightly prolonged body format. For males, the proportion between length and height of the body is at about 8-10%. For females, it is 10-12%. Neck: The neck is strong and broad with slight folds of the skin, without forming a so-called “collar.” Its length is approximately as long as is the head. It is placed at angles 400 in relation to the imaginary extension of the back. Chest: The chest is broad and deep (capacious). The sternum is a little bit below the elbows. The ribs are moderately sprung, neither barrel-shaped nor too flat. The shoulder is well marked. It is moderately connected to the neck as well as to the back. Viewed from front side, breasts are well built, which makes the setting of the front legs broad, but not deployed. Back, Girdle and Stook: The back is strong, straight and broad. The girdle is middle length, the stook – short. They are tightly connected with each other without being protruding or drooping. Croup and Tail: The stoke together with the pelvis bones form a broad croup with good setting and musculature. The tail reaches to the jumping joints or is slightly below them. In most of the cases it is sickle-curved or ring-shaped over the back line. Forelegs: The shoulder blade is long and broad, tightly connected with the trunk, closely to the chest, with a well-marked arch. The humeral bones are middle length and neat to the body. Elbows close to the chest. The under-shoulder bones are vertically placed with slight oval form. The metacarpus’s are firm and springy. Hindlegs: The thighs are long, broad and muscular. The lower thighs are long, at right angles to the thighs. The spring joints are well marked, firm and parallel with each other. The metatarsuses (the unit between the hock joint and the foot) are firm and springy. As the forelegs, the hind legs are straight, parallel with each other, vertically to the earth. 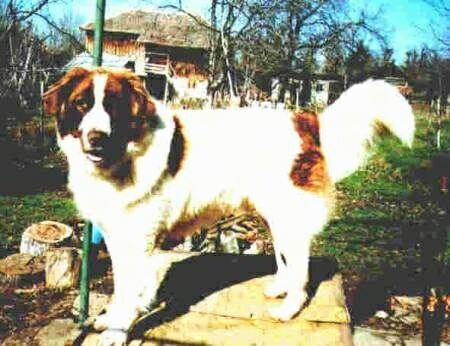 The Bulgarian Shepherd dog is an independent working guard dog. When it is used as such and on the job, aggressiveness is not strongly expressed, but at the same time the dogs are reserved in their attitude toward strangers and demonstrate distance by warning growling and eventual attack. Toward predatory animals (often even toward dogs) aggressiveness increases. The Bulgarian Shepherd Dog is alert, easily adapted to the environment, adequately reacting in situations in which it is involved. Toward its master or handler it demonstrates devotion and fidelity. Its basic sensuousness via sense of smell, hearing and sight is very well developed. Usually tolerant to the children they have been raised with, they love and bond with all people and children within their own family. Those bred and raised to work cannot be pulled from their jobs on the weekends and make good home companions who will lie on the sofa all day, go for walks in the noisy town among people and cars, and run joyfully in parks together with other dogs, and returned to work after the weekend is over. If they are going to be raised to work as flock guards that is what they will be. The BSD is a true working dog with great working characteristics, combined with stabilized exterior appearance. This dog defends pets, guards the farm, and looks for his master and family's safety. For centuries this dog was bred as an independent guarder who makes his own decisions out in the field. If the dog feels he is protecting his property, it is difficult to predict whether or not he will attack. This is a serious guard dog, very loyal to his owners. 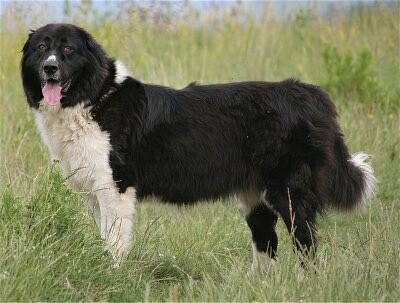 Bulgarian Shepherd Dogs will keep themselves in distance of strangers. They growl and bark. If the person infringes their perimeter dogs will bite him. If the dog is well socialized from the time of its puppyhood with other animals it is not dangerous to live together, especially—rabbits, cats, chicken, lambs, etc. The objective in training this dog is to achieve pack leader status. It is a natural instinct for a dog to have an order in their pack. When we humans live with dogs, we become their pack. The entire pack cooperates under a single leader. Lines are clearly defined and rules are set. Because a dog communicates his displeasure with growling and eventually biting, all other humans MUST be higher up in the order than the dog. The humans must be the ones making the decisions, not the dogs. That is the only way your relationship with your dog can be a complete success. This dog does best in a clean country environment where he can receive extensive daily exercise and a job to do. This breed needs plenty of daily exercise and a job to do. When not actively working it should be taken on daily, long, brisk walk. About 12 - 14 years. They can work as active Livestock Guarding Dogs for about 7 to 9 years. Coats should be brushed about every 2-3 days. Bathe only when necessary. Ancestors of the Bulgarian Shepherd Dogs are the dogs of Central Asia—Afghanistan and Iran area; it is there where the migration process of the ancient Bulgarians began. These dogs are very similar to dogs found in the land of the Balkan Peninsula, which are in the group of the Molossoides. 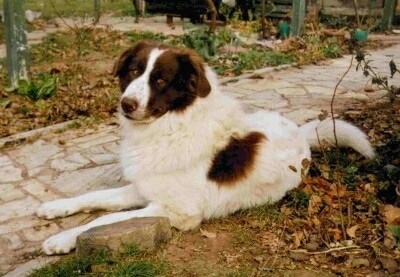 Today the dogs possess the typical makeup characteristics of today's Bulgarian Shepherd Dog. 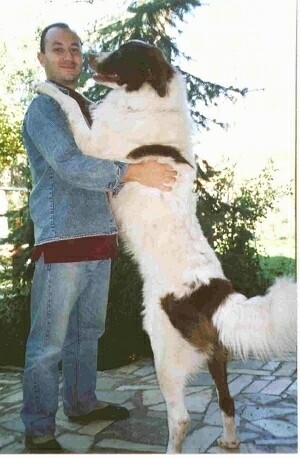 Orfo the Bulgarian Shepherd Dog showing off his size with his owner. Orfo the Bulgarian Shepherd Dog smiling for the camera.